Before Justin Trudeau headed south to the White House, he went north to the Arctic. What happened on the Prime Minister’s first official visit to the Canadian Arctic? Following in the wake of several Canadian ministers who have already made the trip, Prime Minister Trudeau went to the White House for his first tête-à-tête with President Donald Trump. Trudeau has been careful to walk a fine line and avoid overtly criticizing the controversial policies of the new American President, instead choosing to emphasize that they were both elected on platforms of job creation, supporting the middle class, and helping provide a voice for the marginalized. These questions and concerns also resonate in northern Canada—albeit in a very different way—and were key messages that Trudeau highlighted on his recent visit to Nunavut and the Northwest Territories. On his first official visit to Canada’s Arctic since his election in 2015, the prime minister faced a very different public reception. During the election Trudeau’s Liberal Party swept all three seats in Canada’s northern territories of Yukon, the Northwest Territories, and Nunavut, in what was seen as a rejection of the previous government’s Arctic strategy. Now, however, Trudeau’s approval rating has sunk to its lowest levels yet amidst controversy over his visit to the private Bahamian island of the billionaire philanthropist Aga Khan, his approval of several contentious pipeline projects, and the reversal on his key campaign promise of electoral reform. This is especially true in Canada’s North where many feel the prime minister has given them the cold shoulder and frozen them out of decision making. After having met with Yukon Premier Sandy Silver in Ottawa on Wednesday of last week, the first stop on the prime minister’s tour was Iqaluit, Nunavut. The Prime Minister along with his Ministers of Indigenous Affairs, Social Development and Health, immediately headed to meet with members of the Inuit Tapiriit Kanatami (ITK), an organization representing Canada’s Inuit population. Together with Natan Obed, the president of ITK, Trudeau signed a declaration announcing an Inuit-to-Crown partnership. Designed to empower Inuit voices at the federal level, the agreement is the first of its kind in Canada. It will see federal ministers sit down with Inuit leaders, including Obed, at least three times a year to help address Inuit-specific needs and concerns. These include physical and mental health issues, high rates of unemployment, a severe housing shortage, and the lingering affects of the residential school system (a program implemented in the mid 20th century where Indigenous children were taken away from their families to be raised in religious or government sponsored schools). Both the prime minister and the president of ITK highlighted that this was an important step in repairing and building the relationship between the Inuit and Ottawa. Later that day Trudeau, flanked by his three federal cabinet ministers, faced mixed reactions as he attended a packed meeting at the Inuksuk High School. Although some still thronged to get a selfie with the Prime Minister, others silently held signs protesting his broken promise on electoral reform and Nunavut’s housing and employment crisis. Reactions were also mixed regarding the newly signed Inuit-to-Crown partnership. While some remained cautiously optimistic, other such as Elisapee Sheutiapik, the president of the Qulliit Nunavut Status of Women Council, remained skeptical about the lack of clear timelines and deliverables. The next day the Prime Minister travelled over 2,000 kilometers west to Yellowknife, the capital of the Northwest Territories. In addition to visiting the headquarters of the Joint Task Force North, the operational headquarters of the Canadian Armed Forces in the Arctic, Trudeau met with the premier, visited the N’dilo Aboriginal Head Start program, and took questions at a packed town hall meeting. The same issues were on the table: employment, healthcare, and economic development—all problems that are felt more acutely in the sparsely populated and economically isolated northern territories. Again, the reactions of the audience were mixed. Is the Prime Minister giving the north the cold shoulder? Many remained unconvinced by Trudeau’s explanation and wonder if the prime minister is giving northern Canada the cold shoulder. For example, the surprise announcement of a ban on offshore oil and gas exploration in the Beaufort Sea and the Eastern Arctic in late 2016 shook up territorial politics in Canada as the northern premiers, local politicians, and Indigenous governments had not been consulted. The decision was later condemned by all three territorial premiers. Similarly, all three territorial governments expressed serious reservations over the implementation of the carbon tax program—that stem from Canadian commitments at the Paris Agreement—saying that it did not take the unique circumstances of northern Canada into consideration. Nunavut, for example, is almost entirely reliant on diesel fuel for electricity. The federal government has since reversed course and said it will work with the territories to address their unique challenges. In addition to freezing territorial premiers out of decision making, pundits have also pointed to the lack of representation enjoyed by northern Canada in Trudeau’s cabinet. Ever since Hunter Tootoo, a former member of parliament and cabinet member who resigned following an “inappropriate relationship” with a younger staffer, left the Liberal party, the cabinet has not had any members from Canada’s Arctic. Currently the highest ranking elected official from northern Canada is Larry Bagnell, who sits as the chair of procedure and house affairs. 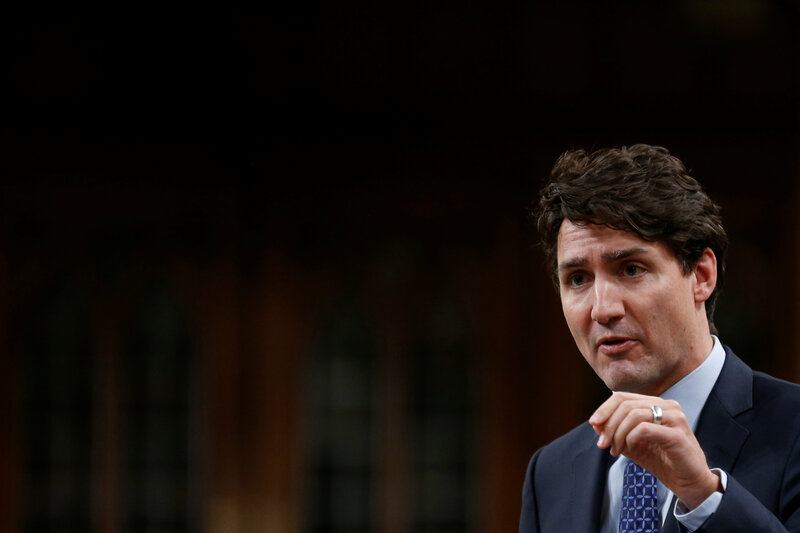 Although a recent Ipsos poll found that more Americans would prefer to have Trudeau as their President than Donald Trump, this will be of little comfort to the prime minister whose approval ratings have reached new lows. And, while many in Canada’s south are only now talking about the end of Trudeau’s honeymoon—he’s now polling at below 50 percent approval for the first time—for many in Canada’s three northern territories the honeymoon ended long ago. To reverse these trends in the north, the Liberal government will need to proceed with caution as they craft their Arctic policy. If this whirlwind tour of the north has revealed one thing, it is that northern Canadians are not content to let Ottawa call all the shots. As Trudeau sits down today with Trump to discuss what he calls their “common ground”—job creation, supporting the middle class, and helping provide a voice for the marginalized—he should remember that while these issues resonate across Canada, they are felt particularly strongly in the north.